On the shores of Lough Corrib near Kilbeg Pier.. 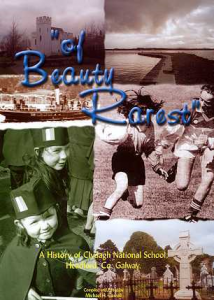 The one hundred and fiftieth anniversary of Clydagh National School is being celebrated this year 2002. A book by Michael Carroll detailing the history of this school was launched on Thursday 4th April in Campbells Tavern , Cloughanower. The book title is”Of Beauty Rarest” (“A History of Clydagh National School, Headford, Co. Galway.”) from a poem about the Clydagh area . The book will run to over 216 pages so book your copy now by emailing Book sales. and spread the word . Celebrates 150 years of schooling and local history in the Clydagh area on the north eastern shores of Lough Corrib, south-west of Headford town. It consists of 216 pages with extensive community contributions, photograph collections and appendices. Near Kilbeg on the shores of Lough Corrib. study of Lough Corrib in conjunction with local anglers.